Since we have been sharing photos of the Soft Shell Crab concoctions that the Skull Creek Boathouse and Dockside Restaurant have been making, here is how they make it to the table. 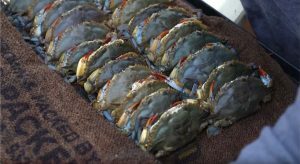 CLICK HERE for a great video of Chef Brad Blake from Boathouse showing how the local soft shell crabs from the Chechesse River get to the table. (Some of us at Southern Lifestyle Properties have had them….all we can say is…...YUMMMMMMMMMMMMM!!!!) We love our local lowcountry seafood!